Fundamental Petroleum Trends has a wide range of reports available. You can view and download any of the reports below with no obligation, no registration, and no cost. To see the most current report - and a large archive of past reports - register for a 30 day free trial or be billed by invoice. Your best source for learning where diesel fuel prices are headed and why. Our incisive analysis identifies and analyzes the impact of fundamental trends on national and regional Petroleum, Retail Diesel Fuel, Natural Gas, Propane and Ethanol markets. We combine our fundamental market analysis with assessment of global oil trends, weather, government fiscal policy, and world financial conditions to provide high value to our clients across the entire energy supply chain. 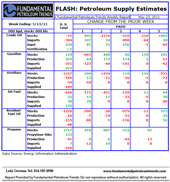 Reports are updated weekly for crude oil & refining, gasoline, distillate, retail diesel fuel, jet fuel, residual fuel oil, natural gas, propane and ethanol. Our reports incorporate propriety graphics providing a unique view of the supply-demand balance for each product and market by combining stocks, production, imports, demand and key price trends into a single view with a multi-year historic perspective and table summary. Clients also benefit from access to the extensive experience of our key personnel though custom market analysis, member specific conference calls and one-to-one consultation. From producers to consumers of energy, Fundamental Petroleum Trends Reports add value to the critical decisions our clients make in managing the market risk inherent to their business. Information you can use today!